In 2001 the UNESCO and the city of Mostar announced their reconstruction plans for the Old Bridge. Various political leaders of the Croats weren’t too happy about that, as they perceive the Old Bridge as a Muslim symbol. 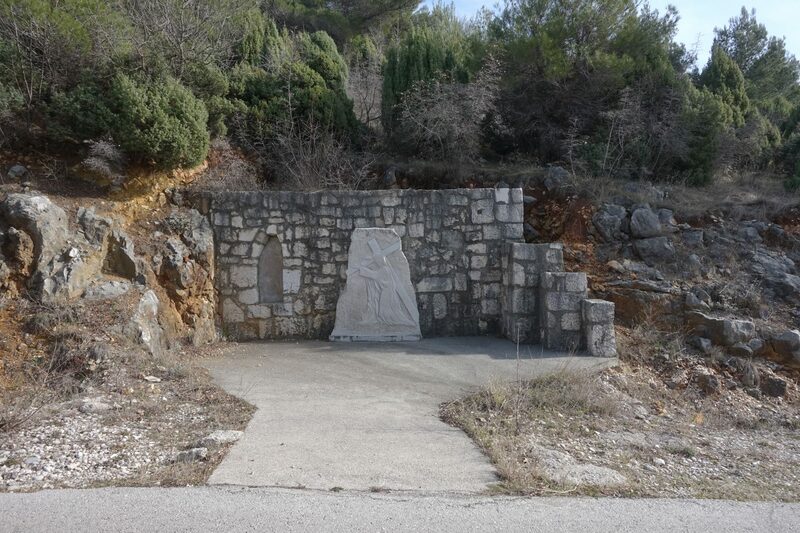 The Croats wanted to leave their mark as well and responded by erecting a cross. 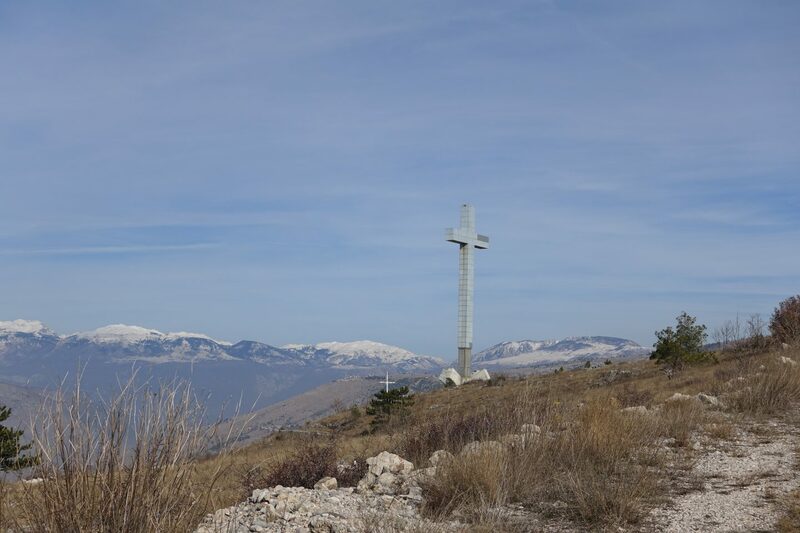 The Millenium cross is on the highest point of hum hill and is overlooking Mostar. It is 33 meters high, was constructed around 2002 and was to represent 2,000 years of Christianity. The cross is supposed to mark a new start. 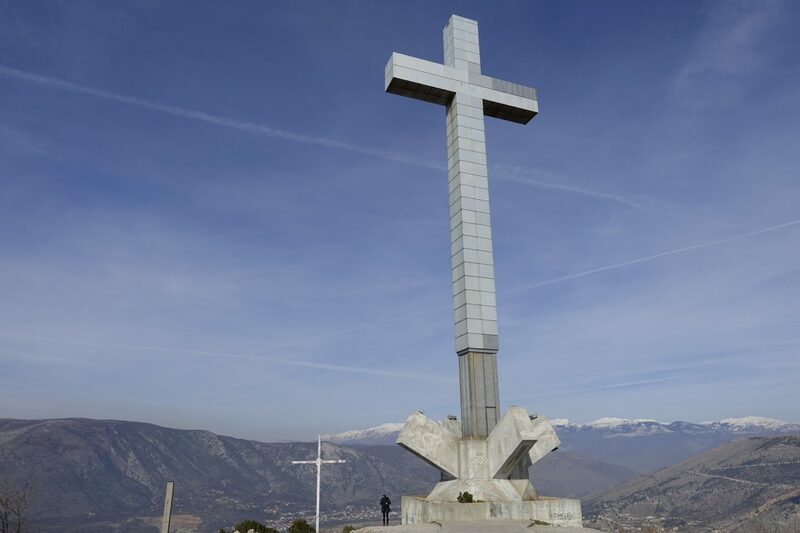 Having a huge cross looming over people’s heads is, of course, something that’s not really of interest to people who follow a different faith and some of Mostar’s Muslims perceive the cross as offensive and humiliating. 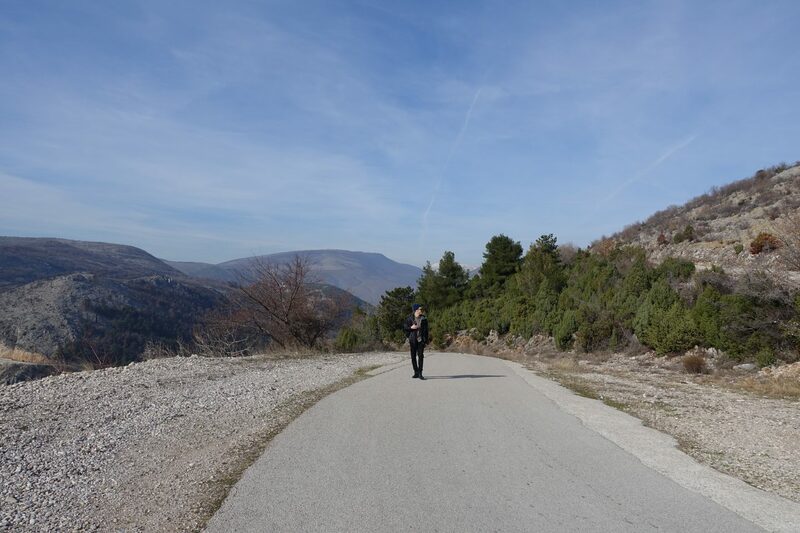 During the war, the hum hill and its views over Mostar were used as a horrible weapon. 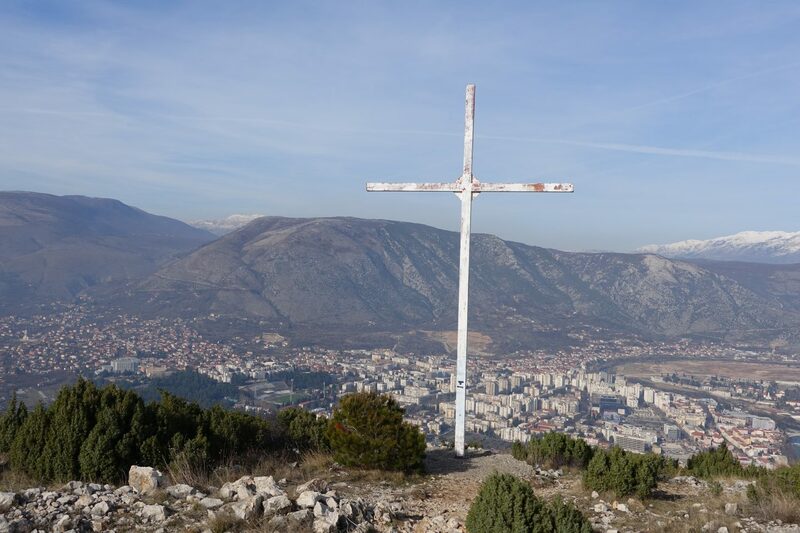 Erecting a gigantic cross on hum hill overlooking Mostar, were the ethnic war raged which physically divided the city for years is, of course, problematic and should not be glossed over. 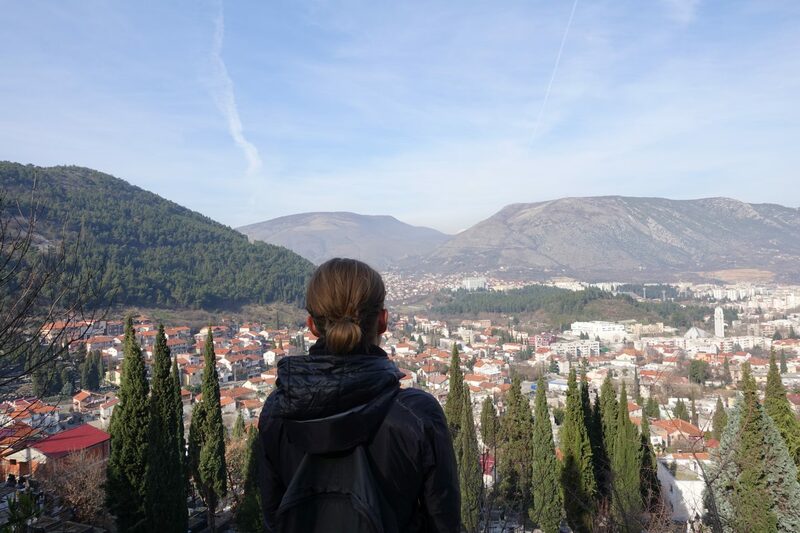 The hum hill offers a fantastic view of the Old Town and the rest of the city. Walking from the Old Town to the peak of hum hill takes roughly 2 hours and although a little tricky, walking is definitely possible. I highly recommend following google maps’ directions as it leads you directly to the cross. We started out in the Old Town following google maps’ directions and slowly but surely made our way up the hill. About 20 minutes into our walk we wanted to take a shortcut and a local kindly advised us against doing so due to mines. My recommendation is therefore to follow google maps directions and do not sway from them, especially once you are on the hill. The first part of the walk is relatively smooth as it takes you through the town. The second part of the walk is a little tricky as you need to make your way up the hill while walking right next to the road. 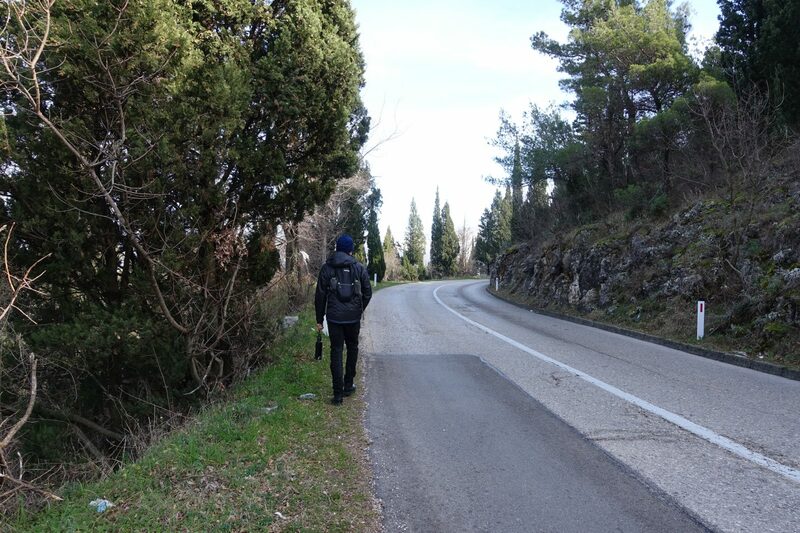 There isn’t a designated footpath and there are parts where walking next to the road is impossible and you need to briskly walk on the road to get ahead. 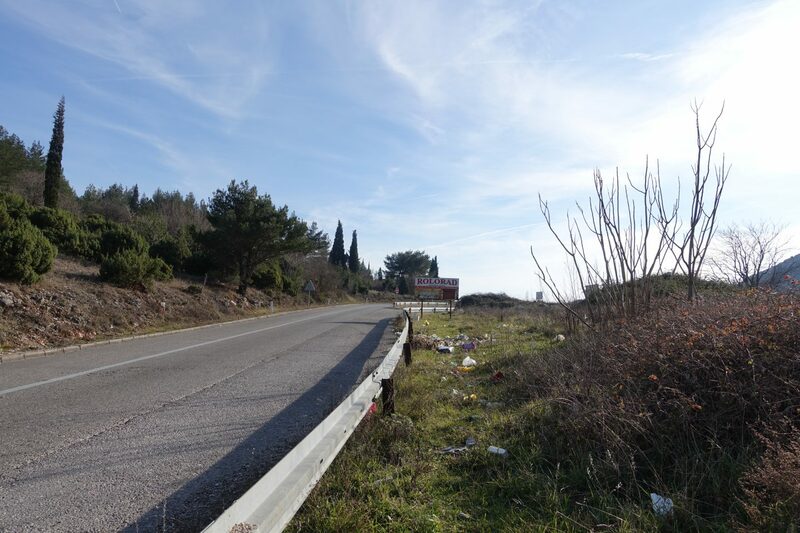 There was sadly a lot of trash next to the road and I would, therefore, advise you to be cautious when walking through it. 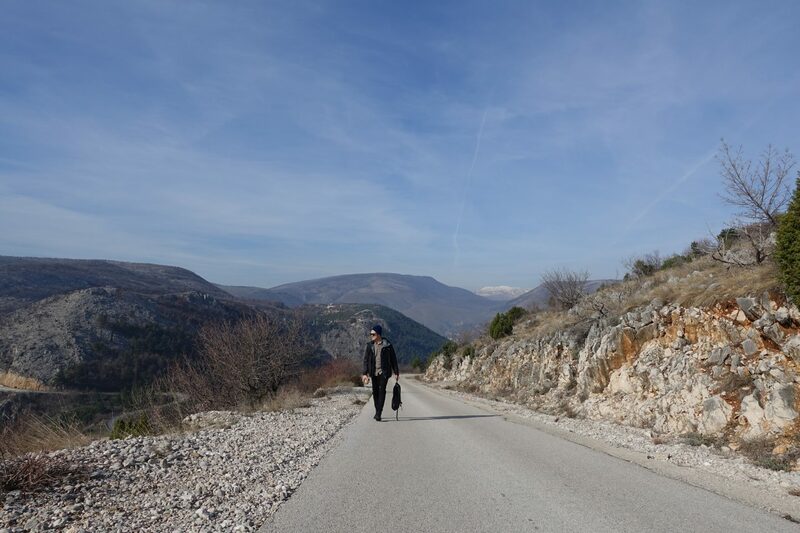 After a while of walking up the hill right next to the road, you reach a narrow road that is only used by cars and people who are going up to see the cross. On our way up we only encountered a handful of cars which made walking a whole lot easier. If there isn’t a lot of traffic you can simply walk right on the road and make your way up to the peak. The walk up to the cross is incredibly scenic and the views are breathtaking! It’s worth mentioning that, due to the shape of the hill, you don’t actually see the cross while walking up until you are almost there. We only had a couple of meters left and finally, there it was – the cross. 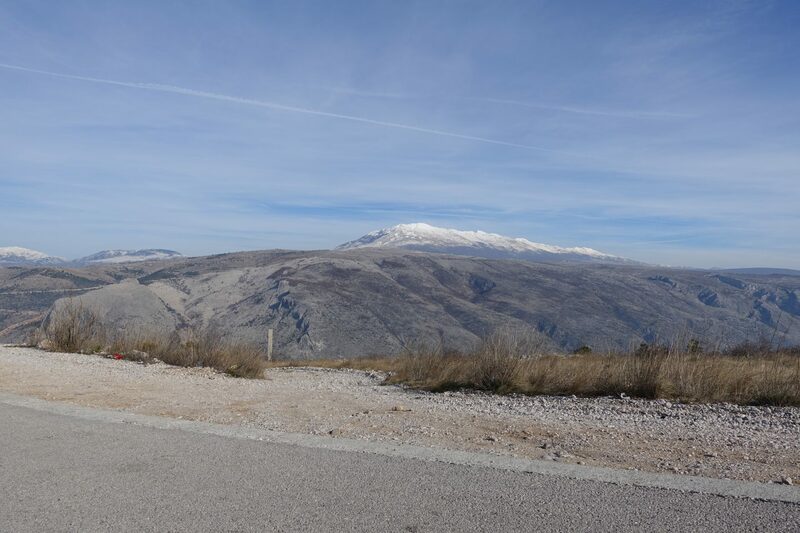 It’s surrounded by white mountain tops and overlooking Mostar. Walking to the peak ended up taking roughly 2 hours and going downhill took around 1.5 hours. While walking up was tricky at times, the last leg of the walk was a lot easier and the views were so worth it. If you are thinking of walking up to the cross on hum hill, I highly recommend it.